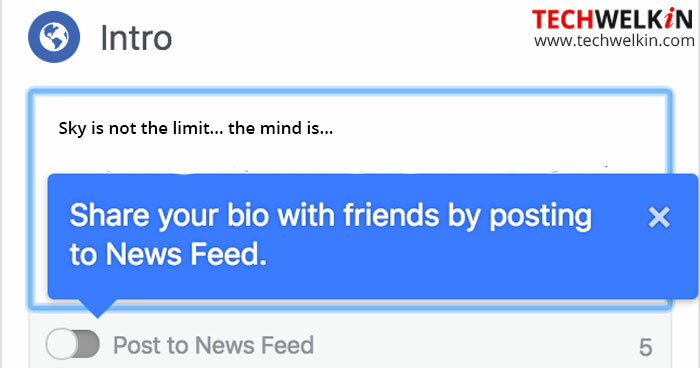 Now you can write a short bio of yourself on your Facebook timeline. We present the best of the cool Facebook bio. These are short one liners that would make your friends and profile visitors laugh. Grab immediate interest of your followers! Facebook has completed rolling out a feature which allows users to write a short Facebook bio in the intro field on their timeline. This is basically a short introduction of the person. The aim of this introduction is to tell the timeline visitors about the person in a nutshell. However, most users prefer to use some clever lines in their Facebook bio. Today, we are publishing a list of such cool Facebook bio lines. In the past we have also published some clever one liners for WhatsApp and Twitter. You may also read these two articles for more one-liners that could be your perfect Facebook bio. We also have ASCII text art and text symbols for your Facebook bio. Just copy and paste as part of your textual bio status. Now let’s dive into the list of sentences that are creative, funny, fancy and… cool! We hope that you’re glued to this list and want to explore more lines for your Facebook bio. Read on! Enjoying?! We are not yet done. It’s just the beginning… read on and find more Facebook bio from store! We hope you liked these one-liners that you can use as your Facebook bio. We will keep on updating this list. So, stay tuned. If you also have something clever to add to this list, please feel free to comment. We will add selected one-liners to the above list along with your name! Thank you for using TechWelkin! Thanks! I enjoyed it. so funny and nice. ?